If you're serious about tennis, this program allows you to choose your playing surface. Hard court, clay, or grass which tends to speed the ball up. Select computer opponents or play solo. The ball is in your court. Exciting tennis simulation with authentic 'feel'. Directed serves, lobs, smashes, drop-shots, angled volleys. You have a one or two player option and can play either a one set warm-up or best of three or five sets. The computer opponent is very good and has 'floating intelligence': the more you improve the better he gets. One minor bad point is that a player always serves from the nearest court to you and players change ends after every service. This is contrary to the rules of tennis! Choose From 4 player patterned after real tennis superstars. You get their strengths, weaknesses, and temperament! Choose a playing surface to suite your style Grass, Clay or Hard Court. Play solitaire against a world class computer player or human opponent even watch 2 computer players challenge each other. “Floating Intelligence” lets the computer vary it’s skill with yours’ as you get better so does he. 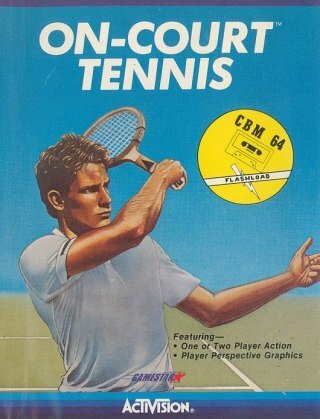 Player Prespective Graphics create “On-Court” realism you can feel Plays like real tennis, not like Pong! Use with 1 or 2 joystick controllers.